Perfect Diary（完美日记) is a domestic makeup brand worth taking note of due to their surge in popularity over the past two years. In a previous newsletter we mentioned that domestic beauty brands are on the rise with young Chinese consumers and this is another prime example. Perfect Diary’s 光影星河 nine colors eyeshadow palette was first released in July, 2018. On 11.11 that year, this product was the number 1 selling eyeshadow on Tmall. Perfect Diary is one of the most popular brands on Xiaohongshu. The brand’s official account has over 1.3 million followers and a search for 完美日记 results in over 80K posts. 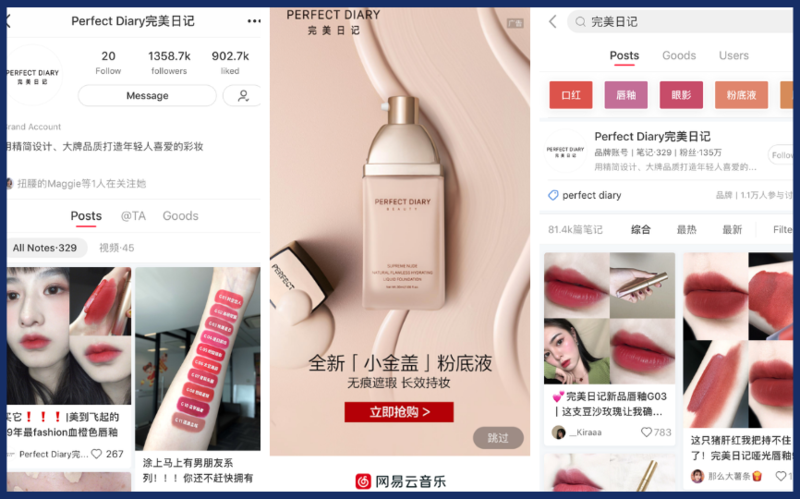 Unlike many other domestic makeup brands, Perfect Diary’s main selling platform is Xiaohongshu, followed by Tmall and Taobao. During this year’s Spring Festival, Perfect Diary’s official Weibo published funny, holiday-themed makeup styles such as “假装乖巧”妆 (appear well-behaved look)，“收红包”妆 (receive red packet look)，“一夜暴富”妆 (get rich overnight look)，and “复古蹦迪”妆 (retro disco look). With warm weather around the corner, it's the time of year that women begin to think more about hair removal. 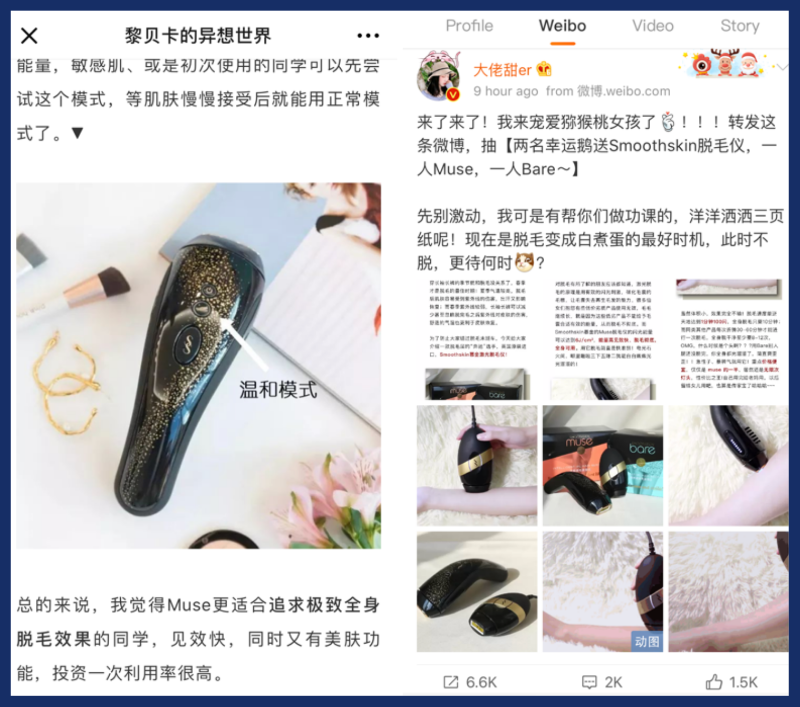 Recently we’ve noticed a number of Chinese bloggers including WeChat KOL Becky Li (黎贝卡的异想世界) and Weibo beauty KOL 大佬甜er having been posting about hair removal products from SmoothSkin. This is a change for the brand, who spent last year mainly focused on collaborating with Xiaohongshu influencers; a search for “Smoothskin” on XHS brings up nearly 1.2K results. It appears that, now that they have tested the waters and raised brand awareness on XHS, this year the brand is focused on collaborating with more established influencers on Weibo and WeChat. This term essentially translates to ‘shopping in the cloud’ or ‘online shopping’, but what it really means is the feeling of offline shopping translated into an online experience. As someone who lives in a 3rd-tier Chinese city for a year and a half back in 2010, I can tell you that shopping is a full-on hobby in lower tier cities and consumers there love the hunt of searching and discovering a new item. Shopping is also a very social experience for them. While the transition to online shopping may be more convenient, much of the experience is lost. But e-commerce live streaming is able to somewhat mimic the feeling. The majority of Taobao livestreaming viewers are females age 25-35 living in second-tier cities. This consumer group has three characteristics: tend to watch for a long time, highly likely to purchase again, high volume of each order. Somewhat similar to Xiaohongshu, Taobao livestreaming viewers come with a purpose. They come in with their wallets, wanting to shop, and are prepared to spend money. From the physical store owner’s perspective, livestreaming ‘rooms’ are low rent with flexible opening and closing times. As I shared in a previous newsletter, top Taobao live streamer 李佳琦Austin has recently become immensely popular on Douyin and Xiaohongshu. Although Austin has only 2 million Taobao fans, half of top streamer 薇娅Viya (scroll down to read more about her), he is very important to Taobao because he is the first homegrown Taobao KOL to “出圈” (which means to step out and become popular outside of the Taobao ecosystem) and Taobao hopes to incubate more Austins in the future. 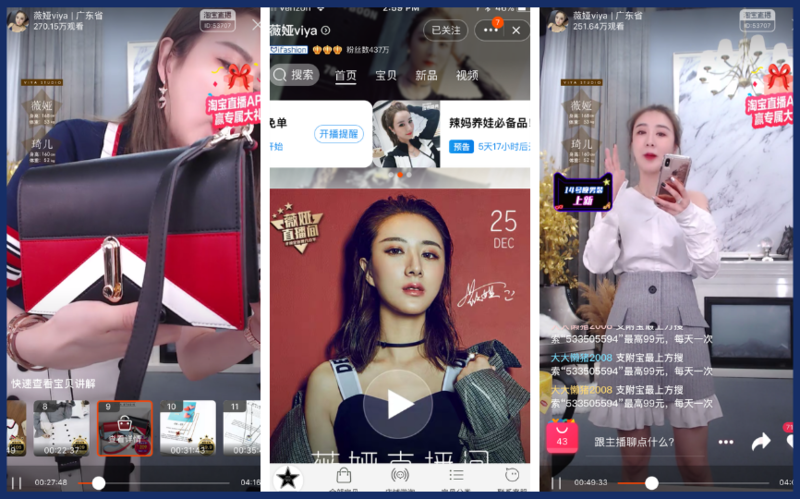 According to Hongpin Wang (红聘网), in 2018 the ‘mortality rate’ for Taobao live streamers was 52%. The platform’s earnings structure is a pyramid, not a healthy olive one. Many people have also discovered that Taobao has stepped into traffic distribution: big influencers are restricted while small livestreamers get more exposure, which is why it is important for streamers to build audiences on other platforms and drive their own traffic. Taobao’s livestreaming app is not competing against Douyin or Kuaishou, and it is not simply a copy of the livestreaming feature in Taobao. The segment of consumers that make the majority of their purchases through e-commerce live streaming already exists and is expanding. The standalone app provides these consumers convenience and a sense of belonging. What is the scale of this group of people? what needs do they have? These are questions that need to be addressed. And the answers will decide whether Taobao livestreaming can grow. With the buzz surrounding the recent launch of the Taobao livestreaming app, I wanted to feature a couple of top Taobao live stream hosts. A couple weeks ago I introduced 李佳琦Austin and today I want feature Viya, a fashion influencer with over 4 million followers on Taobao. Viya is known for her incredible ability to drive sales. During her live stream on October 10, 2017, she helped a Taobao store, which had no existing fan base, generate 70 million RMB in sales, breaking Zhang Dayi’s 20 million RMB record. During 2018’s 11.11 shopping festival, Viya created another record of 267 million RMB within two hours. Viya’s live streams move at a rapid pace and cover a lot of content, with her describing each item’s material, demonstrating the fit, explaining what is special about each piece, and teaching viewers how to match it with other pieces and create different outfits. Viya is very good at creating scarcity, often selling limited batches of items, which go on sale during her streams and sell out within minutes. The article shares how Viya started her Taobao business, how she captured the livestreaming trend, and how she generates profit from it.